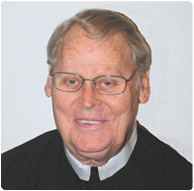 Redemptorist missionary, Reverend Joseph Gorney, died on December 3, 2012 at the Vice-Province of Richmond’s retirement home, St. Alphonsus Villa in New Smyrna Beach, Florida. Father Gorney was born on February 14, 1925 in Baltimore, MD professed his first vows as a Redemptorist on August 2, 1946 ordained on June 17, 1951 and died at 12:30 PM on December 3, 2012. He attended High School at St. Mary’s College, the Redemptorist Preparatory Seminary, in North East, PA. When he finished his novitiate year in Ilchester, MD he went on to complete his theological studies at Mount St. Alphonsus, the major seminary in Esopus, NY, where he was ordained. From 1953 to 1961 Father Gorney served in the then-Vice-Province of San Juan, which included Puerto Rico and the Virgin Islands. His assignments took him to Caguas, Aguadilla, St. Thomas, Frederiksted, and Mayaguez. Next he served in the Baltimore Province from 1966 to 1970. He was stationed in the Redemptorist parishes of St. Cecilia in New York City, St. Clement’s in Saratoga Springs, NY, and St. Mary’s in Annapolis, MD. Then from 1970 until the present he served the majority of his priesthood in the Vice-Province of Richmond. His assignments included the cities of Tampa, Opa-Locka, and Wauchula in Florida; Fort Oglethorpe and McDonough in Georgia; and Orangeburg in South Carolina. In 2002 he began a semi-retirement ministry in New Smyrna Beach but continued assisting regularly in Astor, FL even when he was well into his 80s. Did he suffer any hardship? Yes, he did. Perhaps the worst was the fact that both of his parents died in the same year, the year when he was about to be ordained. The silent prayer of every man in the major seminary is that his parents will be able to receive his first priestly blessing. Sometimes one parent may not be present to share in this joyful, moving moment. Sometimes both parents may not survive to celebrate the day. But it is extremely rare for both parents to pass in the same year — just months before ordination. Despite this huge emotional loss, Father Joe persevered through his ordination, and through all of his studies, and through all of his apostolic work as a priest here on earth. We pray and rejoice with him now as his perseverance brings him to heaven where he can finally give his parents, John and Elizabeth, his first priestly blessing.